Notes: The St. George's (Yuriev) Monastery is usually cited as Russia's oldest monastery. It stands in 5 kilometers south of Novgorod on the left bank of the Volkhov River near where it flows out of Lake Ilmen. 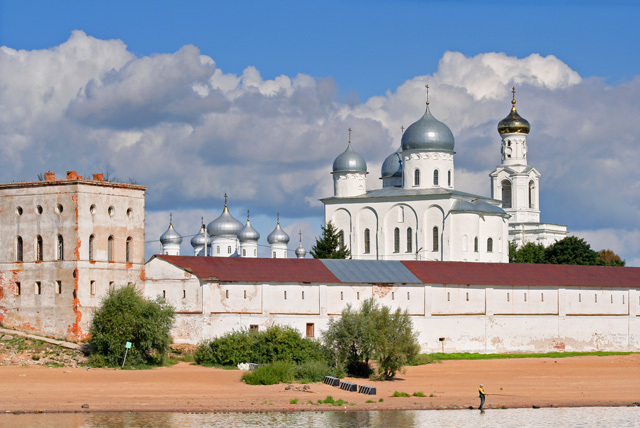 The monastery used to be the most important in the medieval Novgorod Republic. It is part of the World Heritage Site named Historic Monuments of Novgorod and Surroundings. According to legend, the monastery of wood was founded in 1030 by Yaroslav the Wise (whose Christian name was George); the first historically reliable reference to it is from the early 12th century when the stone building of the main church (the Church of St. George, Georgieveskii Church) was started in 1119 by Prince Vsevolod Mstislavich of Novgorod and Pskov and Hegumen (roughly equivalent to a western prior) Kyuriak (Kirik) and built by the master Peter. By the first third of the 13th century the hegumen had been raised to the status of an archimandrite (roughly equivalent to an abbot, i.e., the head of an important monastery, although the comparison with western abbots is imprecise); Archimandrite Savatii is mentioned asking the Novgorodians to bless his successor just before his death in 1226.:68 This has led some scholars to argue that the archimandrites of the Yuriev Monastery were elected by the veche, although there is very little evidence of this; in 1226 it appears that the Novgorodian elite approved the election of Savatii's successor although whether the veche took part is unclear. A later veche (more a mob than a governmental assembly in this case) held the Archimandrite Esif (Iosif - Joseph) overnight in the Church of St. Nicholas on the Marketplace in 1337. The chronicle does not say how the crisis was resolved, but the next year Esif was elevated to the Archimandrite of St. George after the death of Lavrenti. In 1342 he was sent to Koporye on a mission to secure Posadnik (burgomaster) Fedor Danilovich who was detained there. Russian monasteries at various times became guard-houses for prisoners of state. Also, in 1345, the church of St. George was renovated and new lead added to the roof under the direction of Archimandrite Esif.The monastery was ravaged during the Soviet rule. Five of its six churches were destroyed by 1928; the monastery was closed in 1929. During the World War II, the buildings were occupied by the German and Spanish armed forces, and were seriously damaged. In 1991 the monastery was returned to the Russian Orthodox Church, and parts of it have been renovated since then. However the western part, including a church there, are still in ruins.